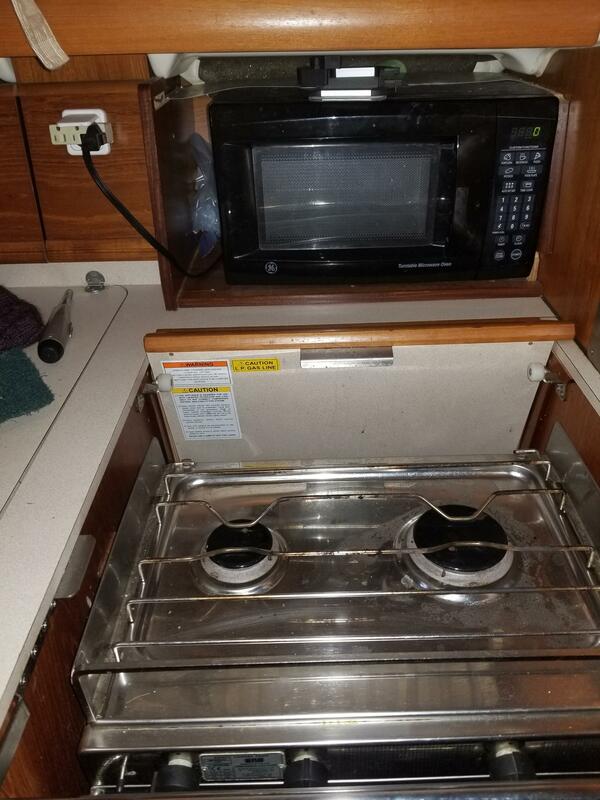 I have a 2001 Jeanneau 43DS and I want to install a microwave oven behind the propane stove. It appears Jeanneau has already prepared the area by cutting out for an electrical outlet. Has anyone removed the necessary parts to slide a microwave in. I prefer not to damage the existing wood or the wood I have to remove to gain the necessary clearance. At a future date I want to remove the microwave and reinstall the original cabinet. I am not sure but do you have 2 or 3 cabin version. We have a DS40 and I think the 43 is just a longer version. We have a 2 cabin version. We put the microwave above and behind the top of the reefer. I have the two cabin version of the Jeanneau 43DS. There is room for a microwave oven behind the propane stove but some existing wood work must be removed. 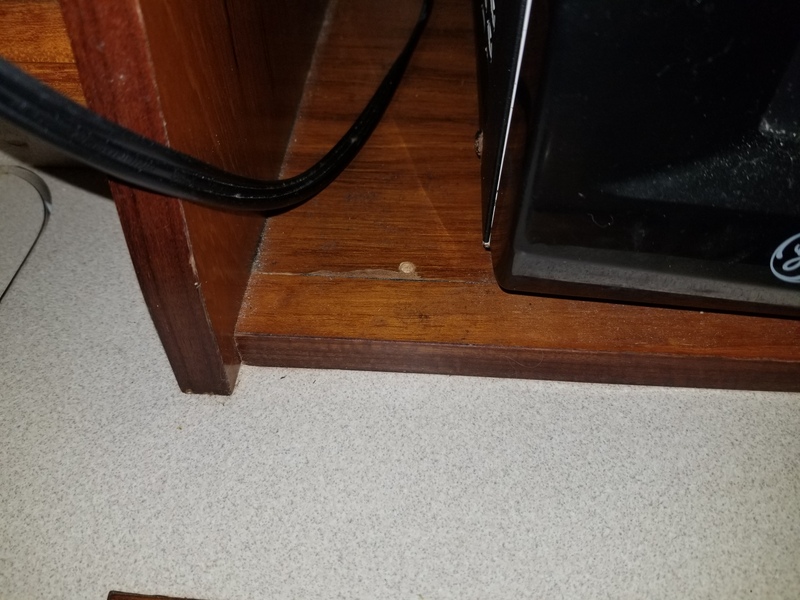 There is even a hole drilled for the electrical outlet but it is covered by wood that is used to make this area a cabinet. This and other pieces are what I want to remove to slide a microwave oven in place. I could just rip out the material that interferes with the installation but I want to replace these pieces when I remove the microwave oven. I removed the cabinetry to install my microwave, and had to cut one piece(I think), to make it work. You have to first go shopping to find something that "might" fit, and then see what sort of mods you need to actually make it fit. I still have the old door, but I think that the rest of the cabinetry was sacrificed. I have a firm memory that one piece was cut to make a finishing piece on the bottom edge. I will post a photo later. 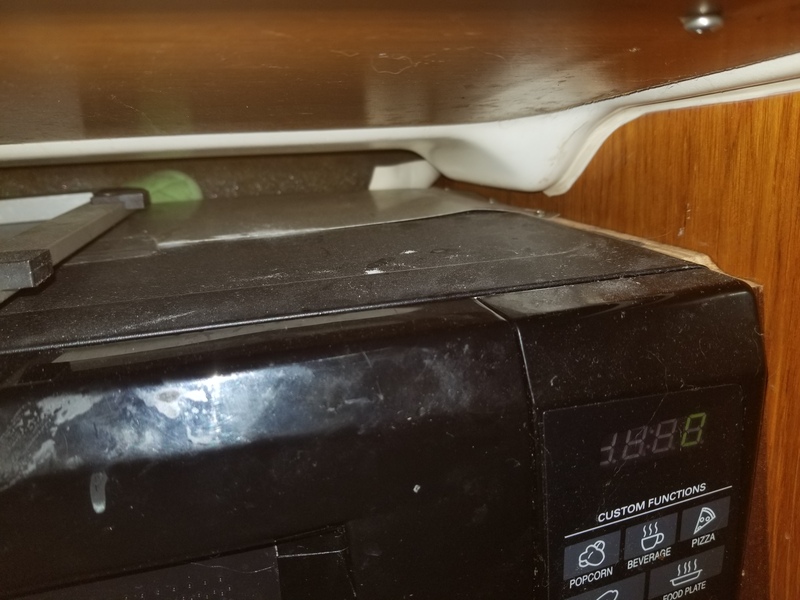 I have not yet installed an electrical outlet inside the cabinet where the microwave sits - it has been a low-priority job for only about 12 years, but should rise to the top this winter. 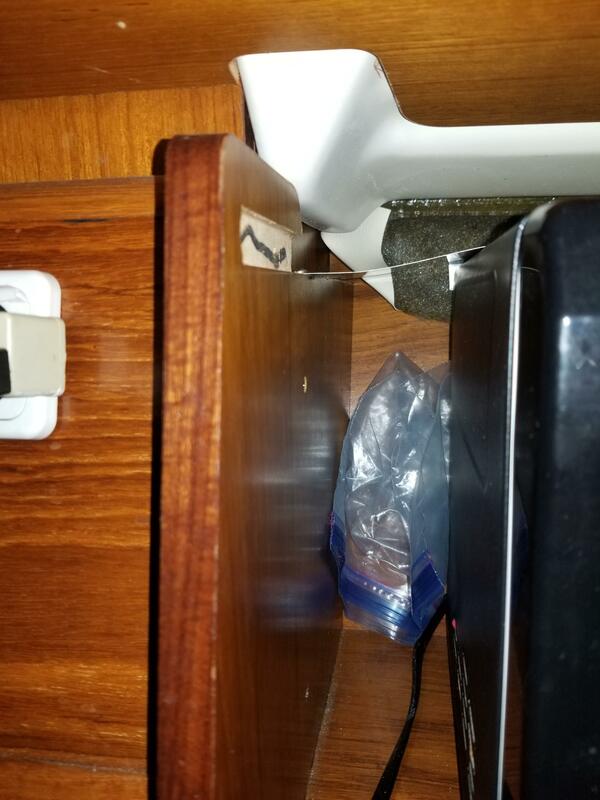 More important is figuring out how to secure the microwave inside the cabinet so that it does not slide out when the boat heals, or falls off the top of a 20 ft wave. It is tricky because there is not much space in the cabinet to fit a screwdriver. I will take some photos of my installation and post them later to give you an idea. Here are some photos of our Microwave. It is a GE unit, and we probably bought it because it would fit. There are not many that meet that part of the spec, so your choices will likely be limited. I remember installing the sheet of aluminum across the top, but I don't remember how or whether the microwave itself is somehow attached at the bottom or the back. It must be, however, because it has never slid out of the cabinet, all the way across the Atlantic, and then up to Scotland. I wonder whether I screwed down the chassis of the microwave, with the exterior cover off, and then just put the cover in place, with the sheet of aluminum to hold the cover down. This needs to be looked at again. I was also right about the trim piece. You can see it in one of the closeups. This was done after we moved on-board in 2007, and we begged the help of a friend who had access to a table saw to make the cut. I can also see where the wood came from, above the microwave. There is no evidence of a cutout for an electrical inlet, so part of my project would involve cutting a hole and installing an outlet. Maybe next month, after the more pressing projects are complete. You will have to leave the bottom plank in place, or else you won't be able to open the door of the microwave without closing the cover over the stove. Of course, the microwave itself is not the end of the project, if you want to run it at anchor. It needs A/C power, which requires either a generator or an inverter. And an inverter to run this microwave will draw about 120 amps at 12v DC, so you will need to run the engine or have a large battery bank. It can get very complicated, very quickly. If you have any questions, don't hesitate to ask. Thank you so much RXC. Your pictures are excellent and give me the confidence to proceed. Thanks also for the head's up on the power requirements. I am a live a board so am generally attached to shore power.